Find a rental with Bay views at Resort Harbour. This San Carlos Bay vacation rental features spectacular scenery from your 6th floor screened-in balcony. Sunsets every night over the sparkling waters, barrier islands and Sanibel Island! Spectacular views also abound to the north, across the Caloosahatchee River at Cape Coral. This vacation rental features renovations completed in the fall of 2013 by professional interior designer. All new master bathroom and kitchen along with furniture, flooring and painting throughout. 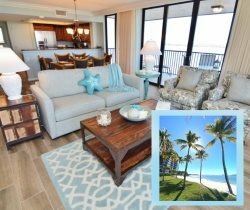 This condo on the beach has an upscale seaside décor highlighting blues, greens, and yellows with splash of vibrant jewel tones. The appliances and electronics are upgraded and new. The master bedroom has a king bed and the guest bedroom has two twin beds. The living room sofa is equipped with a sleeper. Sleeps 6 people. Find out more about our other luxury rentals on the beach. You may have found this rental on HomeAway 3893213, HA ID 3893213, VRBO 3893213ha, or Vacation Rentals 3893213. Absolutely perfect! Convenient and well taken care of property and grounds. Would stay again. Thank you for a wonderful vacation stay. Harbour Tower #611 was a great stay! Everything was nice, clean and in it's place. We didn't need anything. The kitchen was fully stocked and everything worked great. The view from the balcony was very pretty. Watched the sunset. The pool was clean and the chairs on the beach were a plus. We had a slight issue with the shower. Maintenance was in the room within an hour to fix the problem! This complex was perfect for our group! We had five families, including 13 children. We all had a fabulous experience! The condo was beautiful, the pool was perfect, the beach was so clean! Couldn't have asked for anything more! Thanks again! Talking to the reservations agent was great. She was responsive and got us the contract ASAP. The property was great. The room was beautiful, the beaches were close. The pool was heated. We came with two children and two elderly parents, so there were 6 us in a 2 bedroom. We were worried about space, but it was perfect. We all had enough room, the kids had a ball, and my parents could get around easily. It was the perfect Spring Break. Our stay was fantastic. I went with my five-year-old son and my mom and we had the best time. I loved having the beach and pool right there outside our door. It was nice to be in such a peaceful area as well, very relaxing and a great vacation spot!